Since I knew it was going to be a crazy week, I made a huge batch of fluffy and flavourful pancakes this morning for the McJordan family. (That's us!) Pancake leftovers are great because you just pop them in the toaster the next day and you've got perfectly warmed p-cakes in a snap! These pancakes were a hit and, to my delight, Vienna ate three of them! She’s a pancake monster like her mama. Too bad I didn’t get a photo, but I did share a 10-second Instagram story of her eating them. These aren’t gluten-free, but gluten isn’t trouble for everyone. More often then not, just cutting out wheat is enough to make a difference. I used red fife flour but I’ve made these p-cakes so many times I basically just swap in what ever flour I have on hand. I’ve made it with spelt and quinoa flour, with buckwheat and quinoa (a gluten-free option). You can use my flour swap chart if you want to use a flour you already have on hand instead. The only flour I would not sub based on these ratios is coconut flour, because you already know it’s got it’s own personality when it comes to p-cakes. However, my recent banana spice muffins were incredibly easy to make and they are coconut flour–based. Have you tried them yet? By the way, I made Quinoa Stuffed Acorn Squash last night and I mentioned I would be sharing them on the blog today, but we are going to put them up Thursday instead. Sorry if you came here for the acorn squash, but don’t worry, they will be worth coming back to on Thursday when the video is done too. 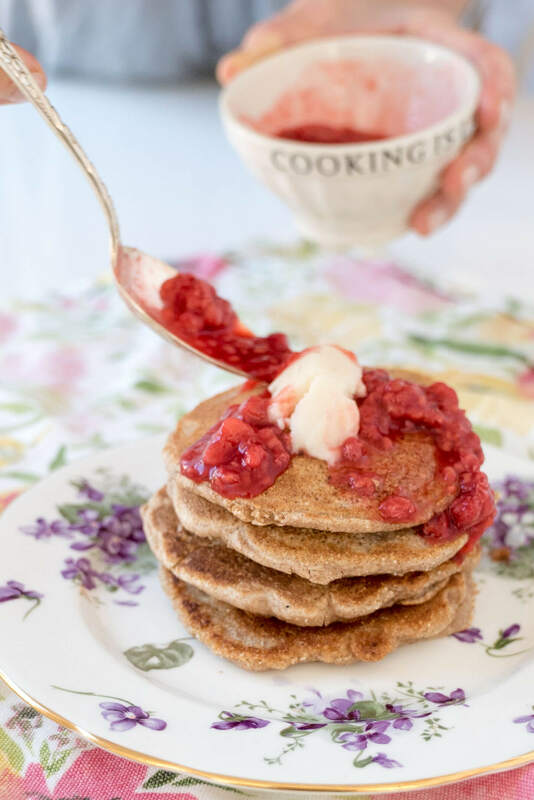 Since it’s such a busy week, I’m not going to go into all the health benefits of these pancakes, but I will tell you that they will joyously fill your belly! I was very satisfied until lunch because these pancakes are a great source of fiber, good fat and protein. However, as I’m putting these photos in to my blog I’m getting hungry again. I added raspberries just so I could call it a “raspberry compote!” Technically it’s not a compote, but close enough! Plus, you’ll get an extra hit of fiber and antioxidants from the raspberries. Here’s the recipe. And in case you’re wondering, that’s a nice schlop of coconut butter on top. Curious about the difference between coconut butter and coconut oil? Combine the dry ingredients in a large bowl: flour, baking powder and spices. In a separate bowl, combine the apples, egg and nut milk. Add the wet ingredients to the dry and mix until combined. Heat up a large pan to medium/high heat and melt coconut oil, just enough to coat your whole pan. You'll need to add more coconut oil every time you add more pancakes. This is key for pancake perfection. I use my 1/4 cup measuring cup to pour the batter on to the pan. Make sure the pan is hot before you add the first pancake. Cook for a few minutes, just until you see bubbles forming. Flip and cooking for another minute or so. This makes a big batch, so I usually toss them in the oven on the "warming" function while I make the whole batch. I've never actually counted how many it makes but I think it's around 15-18, 3.5-4inch diameter pancakes. Top with coconut butter and raspberries. To make compote, just warm frozen organic raspberries with a drizzle of maple syrup. Mash them with a fork and pour on top of pancakes. You won't even need more syrup! These pancakes are so fluffy, so delicious and so easy to make I hope they become a favourite in your home! 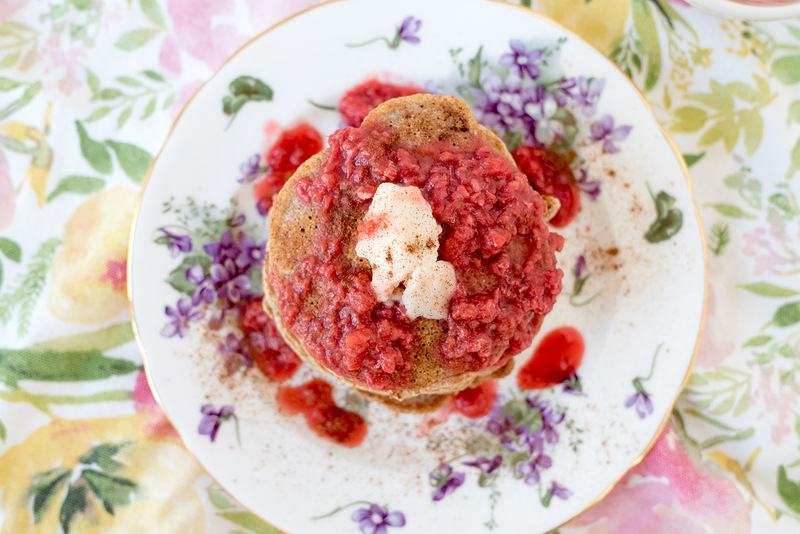 Stay tuned because in my second book Joyous Detox, I have another gluten-free version of these wonderful pancakes. Have a joyous rest of your day! These sound delish! I am going to try for my little bub tomorrow morning. The apples - could you grate them? Are there pieces of apple in the pancakes? Hi! Do you think these would work with oat flour? Yes I think so. 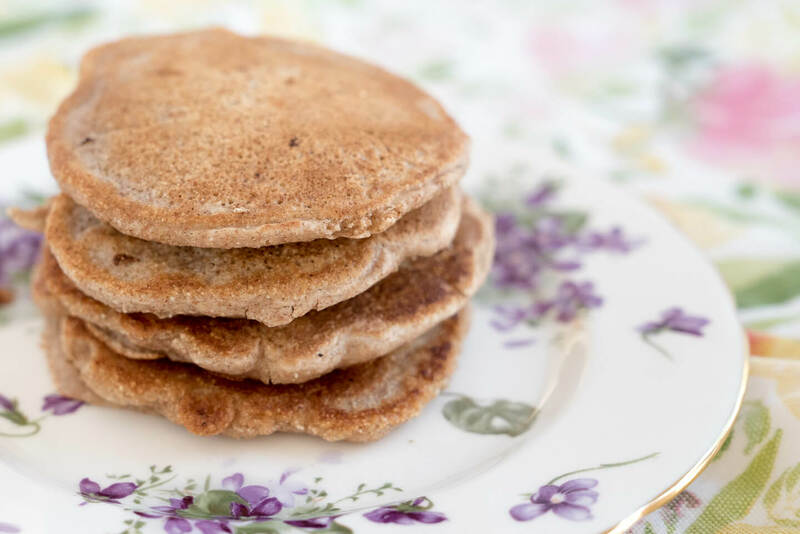 Oat flour is pretty versatile and easy to swap in with spelt or whole wheat. That being said, I haven't tried it myself. But do let me know how they turn out! I’m not sure what went wrong, but my pancakes also ended up flat and not at all fluffy like the pictures. I kind of feel like the batter was too watery. What kind of apples did you use? I used Fuji apples - maybe they are too watery? Hi Emily, sorry to hear that! I haven't made this recipe in while but I typically use pink lady or royal gala. This recipe is super easy: https://www.joyoushealth.com/16527-blog-world-s-easiest-pancake if you want to try something different. Thank you! I'll give it a try.